Robert Kuttner (born April 17, 1943) is an American journalist, writer and economist. 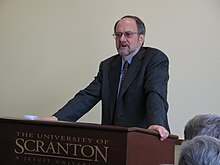 Kuttner is the co-founder and current co-editor of The American Prospect, he is also one of the five co-founders of the Economic Policy Institute and currently serves on its board of directors. Unfortunately, the Laffer curve did not work as advertised. Lower tax rates did not produce more tax revenues. They produced deficits. The total impact of the Reagan tax cuts on capital lowered the effective cost of capital to American industry by an estimated 1.2 percent. Unfortunately, the Laffer curve did not work as advertised. Lower tax rates did not produce more tax revenues. They produced deficits. Kuttner then enumerates the limitations of markets. Deregulation of airlines, for example has led both to a loss of service and to higher average fares. Nor are free markets really free. They come to be dominated by giants, like Time Warner and Rupert Murdoch. This page was last edited on 4 September 2018, at 23:46.